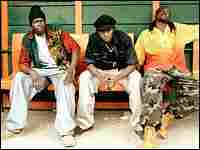 Daara J: Senegalese Hip-Hop The leader of the Senegalese trio Daara J says hip-hop was a familiar sound in the group's native country long before it became popular in America. 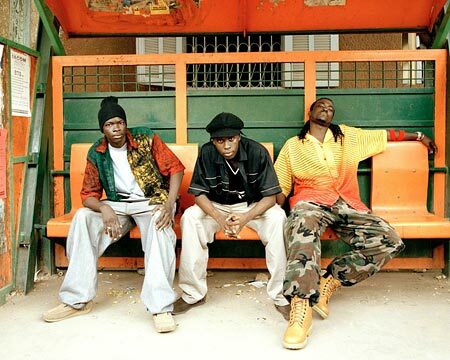 Daara J: (From left) N'Dongo D, Faada Freddy and Lord Aladji Man. It's been said that the blues and gospel have their roots in Africa. The Senegalese trio Daara J insist hip-hop music has similar origins. "Hip-hop was born in Africa [and] went around the world to come back to Africa, like a boomerang that has been thrown from the motherland and is back home," lead singer Faada Freddy tells Michele Norris. Not coincidentally, Boomerang is the name of Daara J's first U.S. release. "The first time we heard Grandmaster Flash rapping on a hip-hop track, everybody was like, 'OK, we know this because this is tasso [the rhythmic oral history in Senegal]," he says. The music on the CD also has reggae and Latin flavors. In the song, "Esperanza" ("Hope"), the influence of the Cuban music the band members heard while growing up is most evident. And Fadda Freddy says it's music to be enjoyed by his generation and that of his parents. "This is an important song for us that puts the youth and the elderly together," he says.